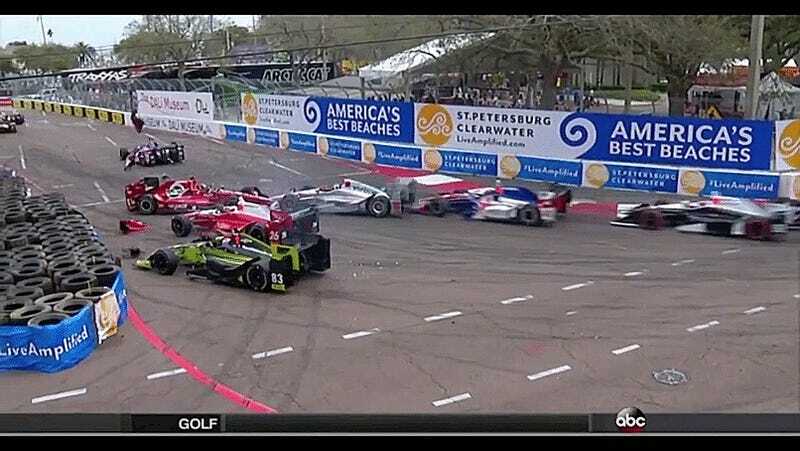 The Verizon IndyCar Series season is off to an interesting start, and it just got weirder when the season opener began. As the result of a strange wreck on the St. Petersburg streets, nearly half of the field wound up in a gridlock resembling rush-hour traffic—complete with the hand signals that go along with it. As shown in the video footage from the wreck, the No. 26 Honda of Carlos Munoz got into the No. 15 of Graham Rahal in turn four. The contact between the two resulted in a jam that collected about two handfuls of cars, and Munoz received a penalty for avoidable contact following the incident.